This western horses lamp has everything you're looking for in a rustic, cowboy-style lamp. From the running horses to the horseshoe base, to the beautifully embellished lampshade that enhances the old west look. Each horseshoe lamp is made from steel and finished by an artist. Due to variations in the temperature or humidity slight variations in the rust finish may occur, but this makes each lamp unique. Perfect for your bedside table, console table, buffet table or as handsome light for your den or office, the metal lamp has a deep rust finish and a 3-way switch. Variations in the lamp shade may occur due to availability. 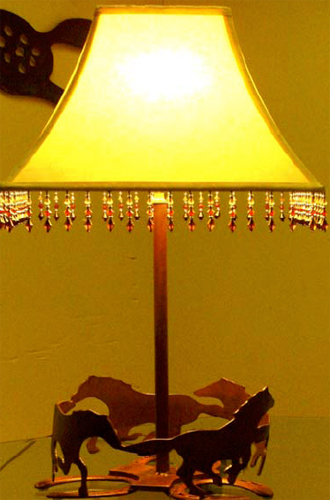 Western horses lamp measures 29 inches high by 11 inches wide. The shade measures 8 x 14 x 10 inches high. Order yours today.